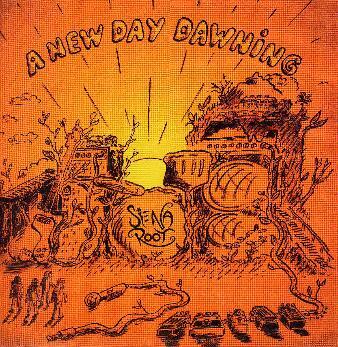 Siena Root - "New Day Dawning"
This is the first full length CD/LP by the excellent 70's rock inspired Swedish band, Siena Root. The band has put out 4 demos cds over the past couple of years. Some of those excellent tracks were recorded for this debut as well. There is a great variety of stuff and not only does the record feature superb vocals and playing but a lot of variety from crunching heavy guitar riffs ("What Can I Do") but always very melodic and the organ plays a nice supporting role. "Fever" is a cool blues song and reminds me of the Allman Brothers. "Rasayana" is a really cool track with sitar and a great heavy song develops out of it. "Trippin'" is probably my favorite track on the CD with some nice jamming. "Little Man" reminds me of early 70's Deep Purple in some way. "Roots" begins with a Doors like organ and a very laid back groove and develops into a cool melodic track. The very heavy "Into the Woods" ends this great CD and again highlights all the great playing oby the whole band. The band have recently made a big change with the lead singer (Oscar) leaving the band. He also played the organ. He has been replaced by a fantastic new singer, Sonya, and you can soon hear her debut on a new 7" coming out on Nasoni Records called Mountain Songs (see review this issue).